Do you enjoy reviewing manuscripts and providing constructive feedback to authors? Are you interested in engaging more deeply in the review process? Would you like to be more involved in the geoscience education community? If so, you might be interested in serving as an Associate Editor. Associate editors (AEs) manage the peer review process for manuscripts submitted to JGE. When assigned a paper by an editor, they seek out and invite appropriate peer reviewers, provide guidance to authors about responding to reviewer comments, and make recommendations to the editors about how to proceed with the manuscript. AEs serve three-year terms, beginning in January and serving through December of the third year. Like reviewers, AEs are volunteers, and we greatly value their contributions to the journal; they are recognized on both the journal website and in the front matter of each print issue of the journal. We solicit applications for new associate editors in the fall of each year. Handle approximately 4-6 papers per calendar year (per volume). For more information about the expectations and process of serving as an Associate Editor, please read the guidelines (Acrobat (PDF) 253kB Oct14 18). Representative of the diversity of the geoscience education community. Previous editorial experience is not required. Interested applicants will be asked to submit a cover letter and a concise CV. 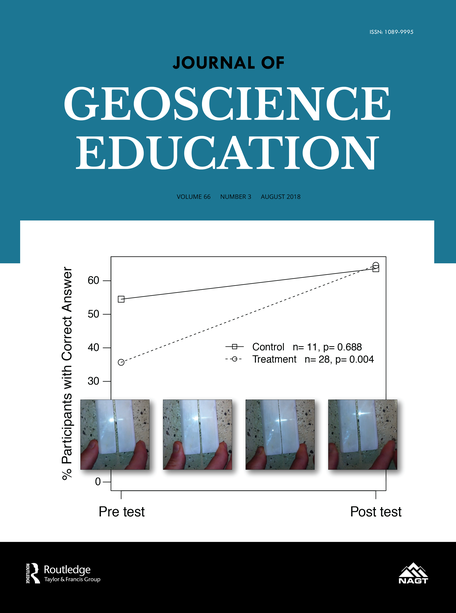 The cover letter should address why you wish to serve as an AE for the journal and describe how you meet the above qualifications, including your area(s) of expertise in geoscience education and education research. The CV should include relevant publications (abstracts are not necessary), any previous editorial experience or other management experience, and other relevant appointments. The deadline to apply to serve as an Associate Editor is November 10, 2018 , and October 1 of subsequent years. Please contact the Editor-in-Chief, Anne Egger (jge-editor@nagt.org).